NOTICE – This project was completed while working at Unified Field Inc. All rights to the project belong to Unified Field Inc. and the client. 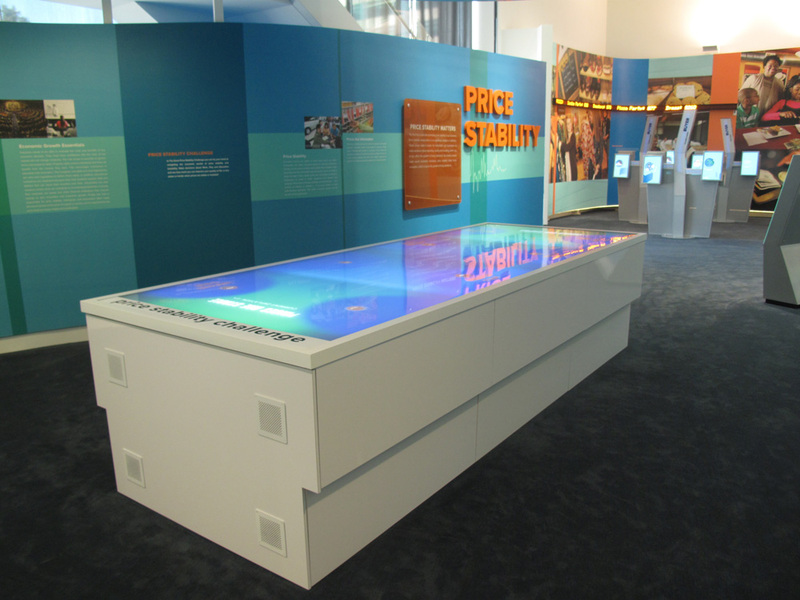 Unified Field was tasked with developing the interactive games and media for an exhibit about the economy and the Federal Reserve at the Federal Reserve Bank of Richmond in Richmond, Virginia. 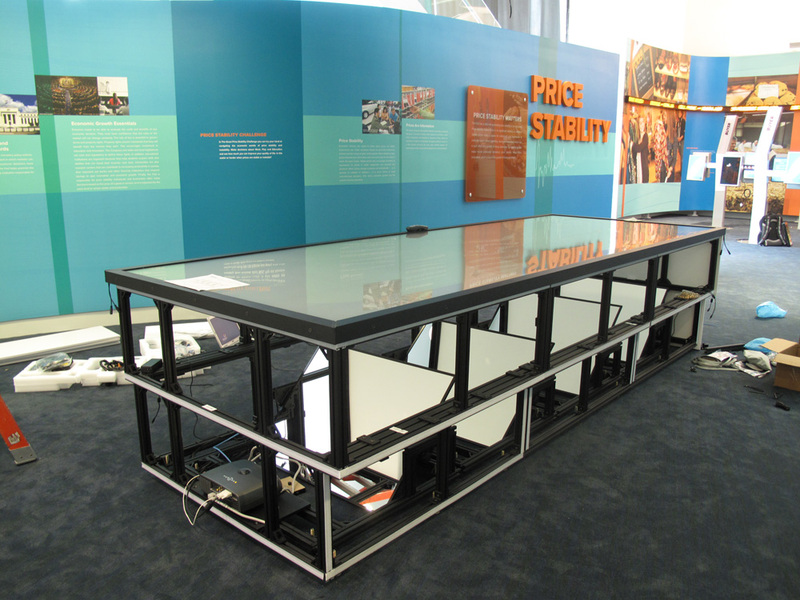 I led the software development of a game called Price Stability, a large custom multitouch table that could accommodate up to eight people simultaneously and teaches users about inflation and price stability in the marketplace. 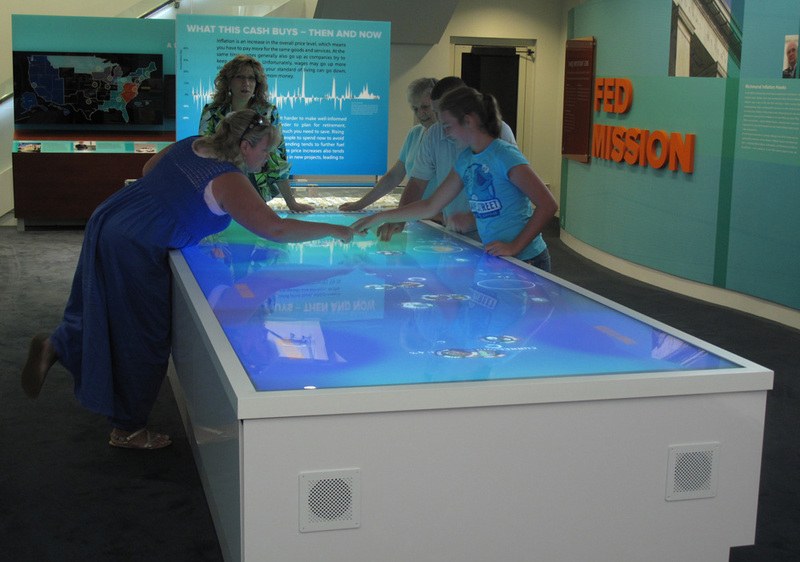 A challenging aspect in designing and developing the game was balancing the interests of stakeholders that included a team of Fed economists, a group of educators that ran the exhibit, and ourselves as game and media designers, while making the game fun, collaborative and educational. 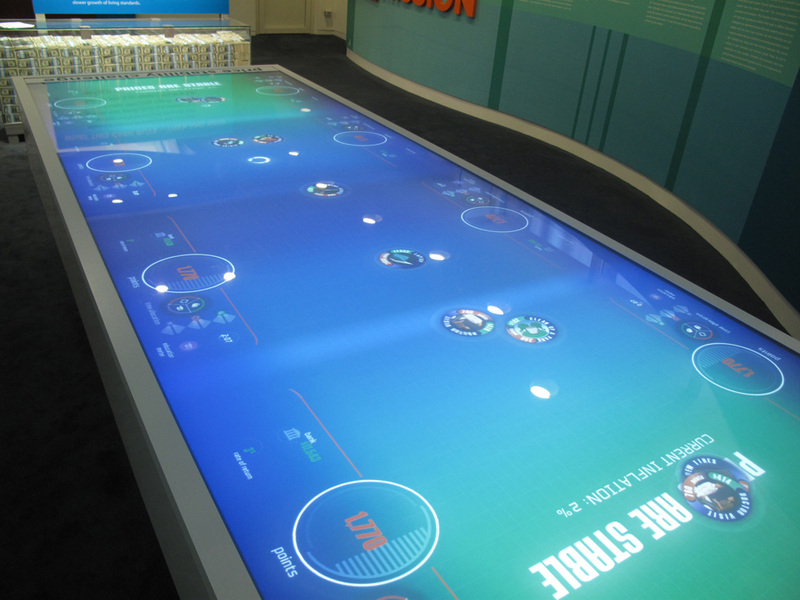 The table dimensions were 12′ x 3′ and could accommodate eight simultaneous users. We used four IR cameras and two computers to track touches. 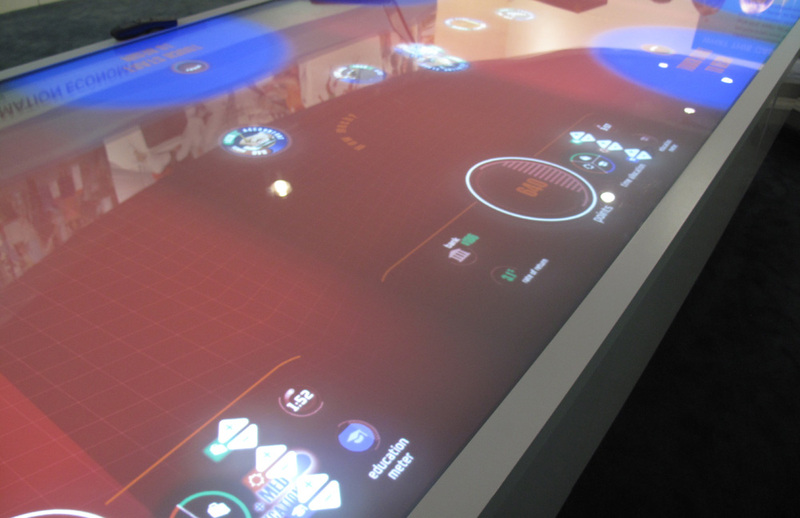 TUIO touches were then sent to the computer driving the game, which was spread across four edge-blended projectors. © Unified Field Inc.
Users would try to purchase goods and services with limited funds during stable inflation, by dragging items from the center of the table to their interface. 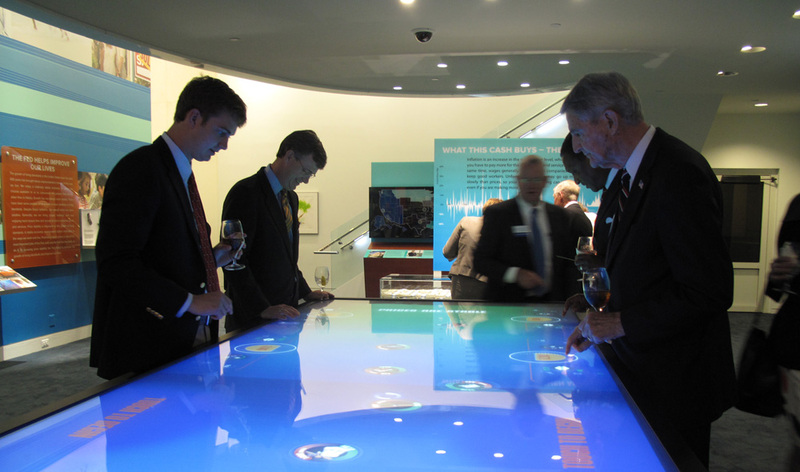 Federal reserve staff play during the opening reception. 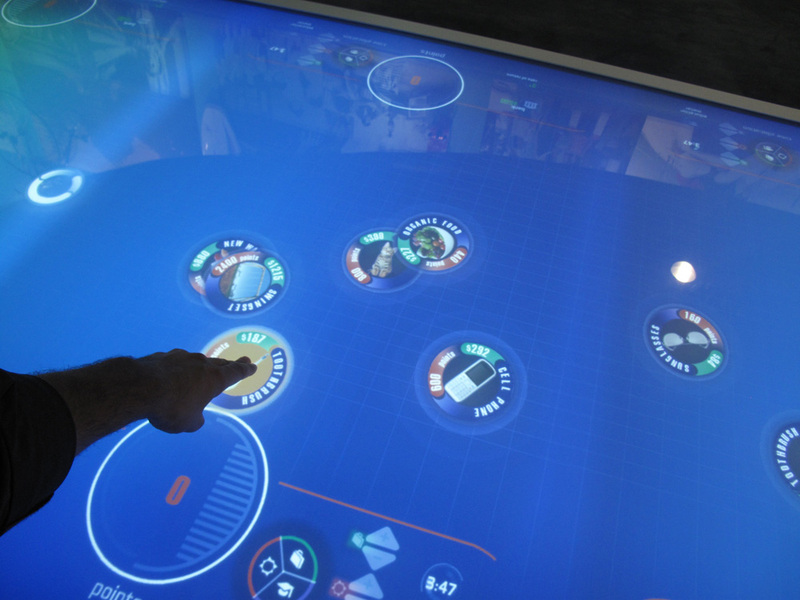 © Unified Field Inc.
One, two or more players could play the game together or asynchronously. Purchasing a good or service by dragging it into the interface. © Unified Field Inc.
During the “instable inflation mode” prices become instable, the goods and services become harder to grab (or purchase), and the background turns red. 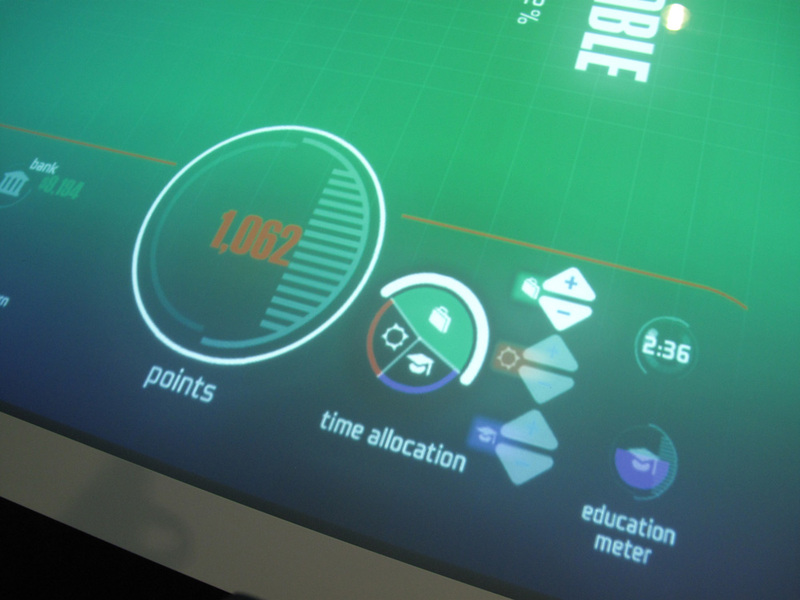 Close-up of the game interface showing some of the draggable elements that allow one to partition time and choose how they make money. © Unified Field Inc.
IKEA, Apple, SFMOMA, Google, Deutsche Telekom, Playworks, AGL, TIAA, Rambus, Complete Genomics, Chicago Museum of Science and Industry, Army Core of Engineers, Federal Reserve Bank of Richmond, NASCAR Hall of Fame, Natural History Museum of Los Angeles, Sony, Dallas Children's Medical Center, Western Union, PIMCO, New York Historical Society, General Electric, National Geographic, NASA - Kennedy Space Center, Liberty Science Center, The Ben Franklin Institute, The National WWII Museum, Toll Brothers, U.S. Holocaust Museum, The National WWI Museum, Leroy+Clarkson.